This year was filled with incredible meals around L.A., but we’re naming the Jeweled Crispy Rice at Kismet (Kismet ranked number four on our Best New Restaurants list) as the city’s dish of the year for 2017. 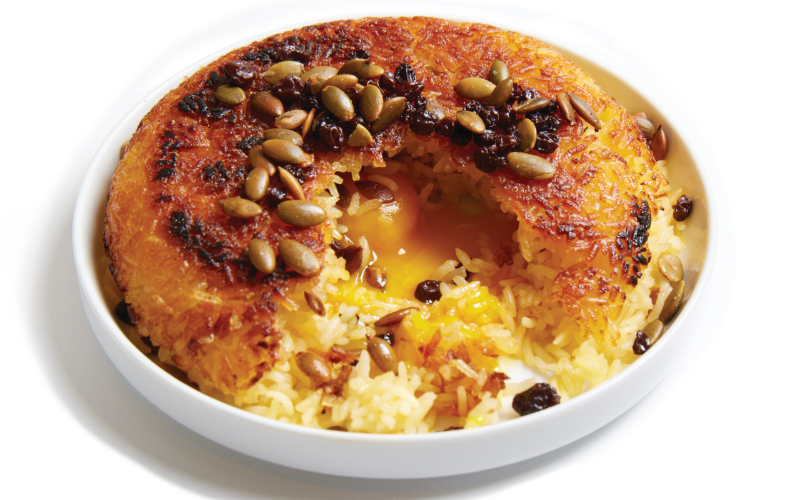 The first time you crack into the jeweled crispy rice at Sara Kramer and Sarah Hymanson’s California-leaning Middle Eastern restaurant Kismet in Los Feliz, it can feel like a magic trick: the shattering crunch of the golden-brown crust, the oozing yolks concealed from view, the sublime one-more-bite starchiness. Taking cues from Persian tahdig, the $14 dish is both a marvel of chef-y technique and a triumph of humble, immaculate ingredients (lest you sneer at the price: handmade pasta, which often fetches a higher premium, is just flour, eggs and water). So how do the women of Kismet transform a seemingly innocuous side dish into a main attraction? The process requires finesse and close attention. Organic California basmati rice, cooked with a satchet of bay leaf and annatto seed. Two farmers’ market egg yolks, warmed through but still runny. Yogurt, butter, and rice flour, mixed with the rice to help form a caramelized crust. Pumpkin seeds, toasted in olive oil before being salted. Sweet dried currants, rehydrated in verjus, the juice of unripe grapes. “We have at least one person on the line each night whose sole job is to make this dish,” says Kramer. To build it, scoops of precooked rice are layered in a small skillet with currants and pumpkin seeds, which add colorful pops of texture and flavor. The rice is then crisped over a low flame, with a sluice of softened butter piped around the pan’s edges to help it brown. Once that signature shell is formed—timing is crucial—two soft yolks are buried in the center of the rice. Then the whole thing is flipped onto a plate and garnished with another handful of currants and seeds. Ta-da!